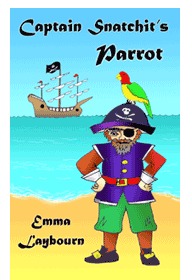 CAPTAIN SNATCHIT'S REVENGE is another exciting tale of the pirate's parrot! Free from Megamouse Books for kids. Captain Snatchit was not a happy pirate. His ship, the Seaslug, had gone gurgling down to the bottom of the ocean. Then, just when he'd found a nice green island to stay on, it turned out to be haunted! The ghosts of a hundred horrible pirates screamed and shrieked at him until he jumped back in the lifeboat and escaped. Captain Snatchit peered across the waves. "That's only a scabby little fishing boat," he growled. "Never mind. It's better than this lifeboat. Hide your hats and shout for help!" So the crew hid their pirate hats and cutlasses and pistols. Then they all howled like lost puppies in a snowstorm, until the fishing boat came alongside. "Can we help? Are you in trouble?" asked the head fisherman, whose name was Afa. "We're not in trouble. You are!" snarled Captain Snatchit. And the pirates whipped out their cutlasses, leapt on board, and overpowered the startled fishermen. "This is my boat now!" announced the Captain gleefully. "I name her the Seaslug 2. 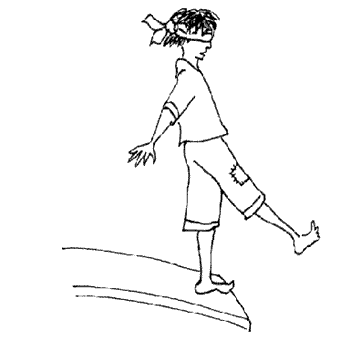 As for you, you crummy cod-catchers - you can walk the plank!" "You can't do that!" cried Afa. "Just watch me," snarled Captain Snatchit. "Anyway, what's the problem? You can swim to that horrible haunted island!" And he laughed a wicked laugh. Afa looked puzzled. "What haunted island?" The Captain pointed. "That one over there, of course, with all the pirate ghosts screaming in the treetops!" "Do you mean Parrot Island?" said Afa. "There's nothing there but birds and monkeys." "Well, who was screaming terrible curses at us, then?" roared Captain Snatchit. "Monkeys don't talk, and parrots-"
He stopped with his mouth open. His eyes bulged in fury. Then he turned purple and bellowed like an elephant with toothache. "There were no ghosts there at all!" he roared. "It was that puffed-up pudding of a pointless parrot! Neptune!" He jumped up and down and shook his fist at Parrot Island. "You made a fool out of me, you over-grown budgie!" he yelled. "Well, I'm coming back to get you. Revenge!" Neptune was a very happy parrot. He had escaped from his wind-whipped sea-sprayed life on Captain Snatchit's ship. He had a beautiful green island to live on. He had exchanged a diet of maggoty ship's biscuits for berries, figs and mangoes. Now and then, it's true, he did long for a taste of ship's biscuit. And he missed his roller-coaster ride on top of the ship's mast. It was only the pirates and their curses that he didn't miss. Neptune never told the other parrots this - least of all his lady-love, Liana. He hoped they would forget he'd once sailed on a pirate ship. But he still liked to sit on top of the tallest tree and feel it sway in the wind like the old Seaslug's mast. He would close his eyes and pretend he was far out at sea. "Neptune!" called Liana. "It's dinnertime! Figs or mango?" What Neptune really wanted was a ship's biscuit. He opened his eyes with a sigh - and spotted something on the horizon. "That's just the fishermen's boat," said Liana. Neptune looked harder. "Then why has it got the Jolly Roger flying from its mast?" "It's a scabby skull and crossbones!" squawked Neptune in alarm. "They're not fishermen at all. They're blinking, stinking pirates!" "They can't be. We scared all the pirates away," Liana said. "Well, now they're back. Oh, no! They're making the fishermen walk the plank!" Neptune flapped his wings in horror as he saw the fishermen go SPLISH, SPLASH, SPLOSH, one by one, into the sea. And then his feathers all stood up on end. He had spotted a familiar figure stamping up and down the deck. "Shiver me tiny timbers and stone the cranky crows," screeched Neptune, quite forgetting his new manners. "It's Captain Scabby Snatchit!" "Don't worry!" Liana reassured him. "We scared the pirates away easily before. We can do the same again." "I hope so!" muttered Neptune; but he was very worried. 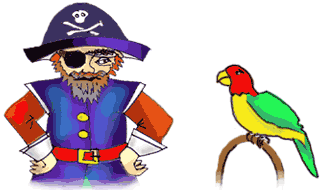 Last time, the pirates had killed monkeys and chopped down dozens of trees before the parrots frightened them away. But he had a feeling the pirates weren't scared any more. Or why else would they be heading straight for Parrot Island? The pirates jumped out of the Seaslug 2 and waded to shore. "Shall we chop down trees?" they asked the Captain. "Shall we start a fire? Or cook a monkey?" "None of those!" growled Captain Snatchit. "We're not staying long. All I want to do is catch that pesky parrot Neptune. Then we'll be off! Well? What are you waiting for, you lazy lugworms? Get catching!" But the pirates scratched their heads as they stared up at a flock of parrots flying overhead. "How do we know which one is Neptune, Cap'n? There are hundreds of parrots - and they all look exactly the same!" "Then catch them all!" roared Captain Snatchit. "With the fishing-net, of course! Do I have to do everything for you, you empty-headed bubble-brains?" So the pirates took the fishing-net out of the boat, while the Captain sat around eating ship's biscuits and shouting at them. Soon the net was spread between the trees ready to catch careless parrots. But the parrots were too careful and clever to be caught. They just flew over the net, screeching at the pirates. "Blistering bumptious birds!" yelled Captain Snatchit. "Take down the scabby net. Pick lots of fruit instead. We'll lure those parrots down!" So the pirates climbed the trees, picking fruit and falling off while the Captain ate more biscuits and shouted at them even louder. They piled the fruit up on the beach and waited for the parrots to descend on it. "Don't eat it!" screamed Liana in the treetops. "Everybody stay where you are!" And all the parrots stayed up in the trees. "Curse those pimply parrots!" snarled Captain Snatchit. He threw down his ship's biscuit in disgust and stamped off. Neptune, perched up in a fig tree, saw the biscuit on the ground. His mouth began to water. He couldn't resist. Swooping down, he grabbed the biscuit in his beak. He was just about to take off again when a big, black, smelly pirate's hat was slapped on top of him. "Aha!" yelled Captain Snatchit. "Not so clever just then, were you? Gotcha!" He was a prisoner on the Seaslug 2. Captain Snatchit had thrown him down through a trapdoor and shut him in the hold with a thousand dead fish. It was very dark in there, and very stinky. The fish smelt even worse than Captain Snatchit did. But even more unpleasant than the dead fish were the crabs. They were very much alive - and in a dreadful temper. Usually the fishermen threw them back into the sea. They did not like being stuck in the hold. They crawled angrily around and nipped at Neptune's toes. "Get off, you scabby crabbies!" he yelped. He huddled unhappily on top of the slimy heap of fish, and hid his head under his wing in sorrow. How could he have thrown away his wonderful life on Parrot Island for the sake of a maggoty ship's biscuit? Meanwhile, back on the island, Liana was dismayed. She had seen Neptune being captured and carried to the Seaslug 2. Then the pirate ship had sailed away. "We've got to rescue him!" she cried. But the other parrots were doubtful. "Do you think he wants to be rescued?" asked the oldest one, Monu. "Well, Neptune used to be a pirate. He talks pirate language. He loves pirate food. And he's always sitting in the treetops gazing out to sea," Monu pointed out. "Maybe he's happier on board the pirate ship! After all, if he wanted to fly back here, he could." They did not know that Neptune was shut in the ship's hold. With a heavy heart, Liana decided that Monu might be right. "Maybe," she said at last, "and maybe not. What if Neptune's hurt and can't fly? At least we should go there and find out!" The parrots agreed to this. They took off in a huge, bright flock. As they flew across the beach, Liana spotted the fishing net which the pirates had left lying on the sand. "Bring the net!" she cried. "If Neptune's hurt, we can carry him in it." So she and twenty of the parrots swooped down to pick the net up in their claws, and flew with it across the waves. The pirate ship had not gone far. Soon they were close enough to see the pirates setting the sails and tightening the rigging. Captain Snatchit lay on the deck sunbathing. "Hop to it, you clueless cockroaches!" he yelled at his crew, without even bothering to open his eyes. If he had, he would have seen the parrots overhead. The parrot flock wheeled high over the boat, searching for any sign of Neptune. But he was nowhere to be seen. Liana sighed. "Maybe he's hiding from us," she thought. "Maybe Monu's right. He doesn't want to be rescued. We should turn round and go home!" Just then Captain Snatchit yawned. He opened his eyes wide, and looked up at the sky. "YAARGH!" screamed Captain Snatchit, leaping to his feet. "Parrots!! Get your guns, men! Get your pistols! We'll shoot those scabby parrots down!" And he dived behind the wheel to find his blunderbuss. "Yaargh!" snarled the pirates, as they all picked up their pistols. "Now!" screeched Liana. The parrots dropped their net. It landed on the group of pirates with a WHUMP and wrapped itself around them. When the pirates tried to fight it off, their hands and feet and pistols all got tangled in it. The more they struggled, the more tangled they became. They lurched to and fro across the boat in a huge, staggering, swearing bundle. But Captain Snatchit was not caught in the net. He was still scrabbling for his blunderbuss. He found it, stood up - and the parrots dived on him. They scratched him with their claws and nipped him with their beaks. "Put down the gun!" they shrieked, pulling his hair and flapping at his nose. The Captain couldn't aim his blunderbuss. He hated being nipped and scratched and flapped. He was desperate to escape. But there was nowhere for him to hide - except down in the hold. In an instant the Captain yanked the trapdoor open and dived in. An instant later, Neptune fluttered out. And an instant after that, Liana and twenty other parrots flung themselves against the trapdoor and slammed it shut again. And two or three instants after that, the lurching, cursing bundle of pirates lurched a bit too far and tumbled over the ship's side with an enormous SPLOSH. And four or five instants after that, a huge and happy flock of parrots was winging its way back to Parrot Island. But they weren't half as loud as the hammerings on the trapdoor, as Captain Snatchit yowled for help. He had thought the nips and scratches from the parrots were annoying - but that was before he fell into the hold, and landed on a heap of several hundred very angry crabs. Afa was a happy fisherman. After he and his friends walked the pirates' plank and went splash into the sea, they swam to the pirates' old lifeboat. They huddled inside it to rest for a while, and then began to row towards their home. They were wondering how long it would take them, when they saw a bright flock of parrots wheeling through the sky, with something trailing from their claws. "That's our net!" cried Afa. He watched the parrots fly to the pirate ship. He saw them drop the net. And, many instants later, he saw them fly up into the air again and flap away. "Let's see if we can get our net back!" Afa said. So the fishermen rowed towards the Seaslug 2. They were puzzled to see nobody on board. As they drew close, they heard the gulps and gurgles of the despairing pirates. Taking pity on them, the fishermen hauled them up into the lifeboat in a great quivering, soggy heap. The pirates were still all tied together in the net. They were too cold and wet to even swear, but just sat looking very sorry for themselves. "Where's your Captain?" Afa asked them. They pointed at the Seaslug 2. So the fishermen climbed on board. The ship seemed to be deserted... until they heard a horrible yelping and yowling coming from the hold. They opened the trapdoor and looked down. There was Captain Snatchit, up to his knees in bad-tempered crabs. He had crabs in his hair, crabs clinging to his sleeves, and a crab dangling from each ear. "Get me out of here!" he howled. The fishermen pulled him out, de-crabbed him and put him in the lifeboat with his crew. Then they took down the Jolly Roger from the mast and put back their own flag (which showed two crossed herrings and an oyster). They sailed away and left the Captain and the pirates in the lifeboat. Captain Snatchit was already starting to shout and curse his men. "Why didn't you rescue me, you lily-livered layabouts? Well, start rowing, you knobbly-kneed nincompoops!" When Afa looked back, the tiny pirate boat was rowing round in circles. He laughed and set a course past Parrot Island. Perched up in his favourite tree, Neptune saw the fishing boat draw near. "Look! They got their boat back from those pesky pirates," he said, gazing at it wistfully. "Are you sure you're happy to be back on land?" Liana asked him. "Oh, yes..." But Neptune sighed a heavy sigh. Suddenly Liana took off from the tree, glided to the fishing-boat and landed on the mast. "Liana!" squawked Neptune in alarm, setting off to follow her. "What are you doing?" he panted as he landed next to her. "I just wondered what it feels like. It is nice, isn't it? You can feel the ship swaying and the sea-breeze in your feathers." "It's wonderful," said Neptune. "But now what are you doing?" Liana had taken off again. She landed on the deck where Afa was eating a ship's biscuit. She sidled towards him and nibbled at the crumbs. "Liana!" Neptune squealed in horror as he plunged down after her. "You'll get caught! Come back!" "I just want to see what it tastes like," said Liana. Afa did not try to catch her. Instead, he smiled. He broke off half his biscuit and tossed it to the parrots. "Here - have as much as you like!" he said. "You parrots have brought me good luck. You got my boat back for me. I don't know how you did it, but you're always welcome here!" "What a nice man," Liana commented to Neptune. "And ship's biscuit is really rather good." "This one's even better than the pirates' biscuit," said Neptune dreamily. "It's hardly maggoty at all!" "I think a voyage on a fishing boat would be fun," Liana said. "How about it, Neptune?" "There's room for two up on that mast." "Yo ho ho!" squawked Neptune in delight.